Have you ever dreamed of becoming a great classical guitarist? Classical Guitar Lessons are available in the Patrice Revel School of Guitar from Alice Goodwin B.Mus. a classical guitarist based in Dublin/Ireland. Alice graduated from the DIT Conservatory of Music and Drama with a First Class Honours in Musicology and performance on the classical guitar. Having studied under international performers such as Dr. John Feeley and Alan Grundy, Alice is equipped to provide you with the best possible experience of learning the classical guitar. She has also benefited from masterclasses with other international performers, such as Berta Rojas, Paul Gregory and Raymond Burley. An accomplished musicologist, Alice has received awards such as the Anne Leahy Medal, as well as receiving 3rd prize in the CHMHE National Undergraduate Musicology Research Awards, was invited to present her paper ‘The Essence of Wagner’s Ring Cycle’ at the 2015 SMI Postgraduate Conference.Alice is offering classical guitar lessons for students of all levels, as well as classes in music theory for any pop or rock guitarists who want to improve their skills. Don’t hesitate to contact us for your free introductory lesson and get started on your own classical journey! How long have you been taking classes with Alice? Can you name a couple of techniques on the guitar that you couldn’t do before, and that you can do now, thanks to the classes? I couldn’t start to play a song from any part of a score, I always had to start from the start of a piece, if I made a mistake. Now I can start to from any point of the score, I have decreased the amount of time that I have to invest learning a song. I learned a lot, but I also generally gained more dexterity, and more confidence when I play. – I can make chords progression and play improvisations. – I have learned 4 new classical songs in one year. Can you describe your feeling about the lessons? Can you tell us how, week after week, the lessons with Alice have helped you to improve your playing? The training that Alice gave me this year has been very helpful in many ways, and I feel that never before I have improved like now, in such a short time. 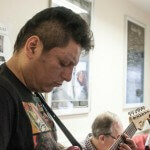 What do you think of the events such as band workshops and gigs? Is it a good compliment to the classes? I always have a great time on band workshops, before attending guitar lessons, I never had the chance to play with other guitarists, and other instruments like bass, drums, and piano, it’s great fun!. The gigs are good opportunities to share our progress with our families and friends , it is a very satisfactory feeling. 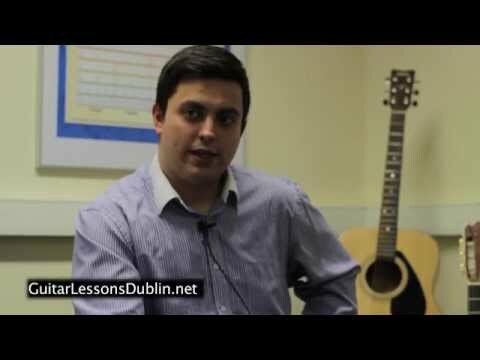 Is there something you can say to someone who is considering taking lessons with guitarlessonsdublin.net, but is not sure yet? Learn how to play is not the easiest thing in life, it requires time patience and practice. Patrice and Alice are excellents professionals that make this process easy!